Mikaiya Gude is a senior at Sebastopol California's Analy High. 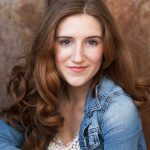 She plans to pursue her BFA in musical theater following graduation. Mikaiya has always found a way to discuss and explore the role of women as both a performer and spontaneous writer.